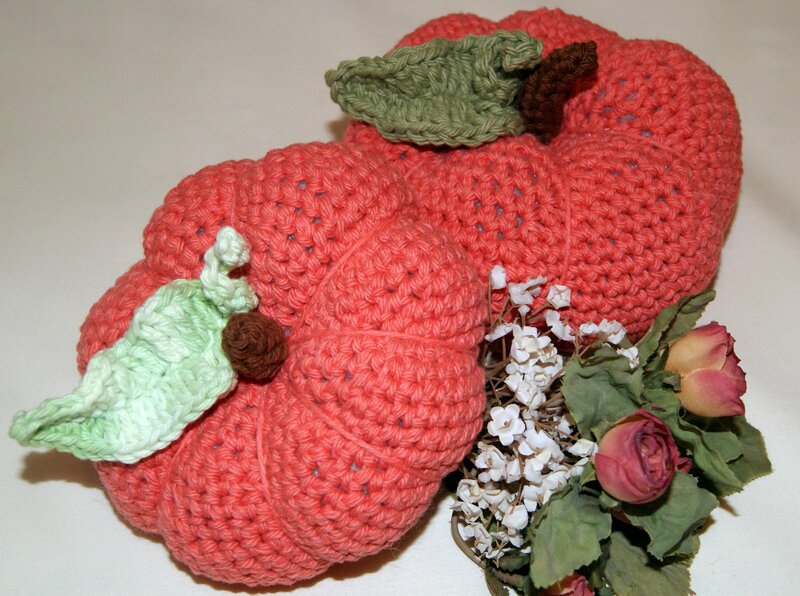 Autumn has arrived and the leaves will soon be falling which stirred my creative juices for crocheting leaves as appliques for my various projects. I will let the “real” leaves turn to compost!! 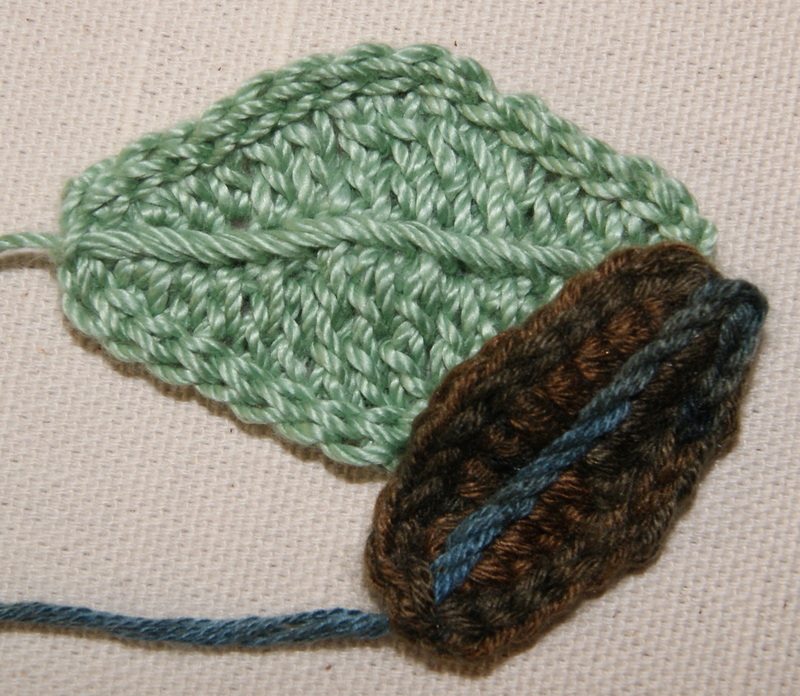 Using a size F hook and size 3 crochet thread, a simple leaf can be yours in minutes. Crochet 16 chains, complete 1 SC in 2nd CH from hook, in next three chains make 1 HDC, next 2 chains make 1 DC, next 3 chains make 1 TRB, next 2 chains make 1 DC, next three chains make 1 HDC, ending in last chain with 1 SC. 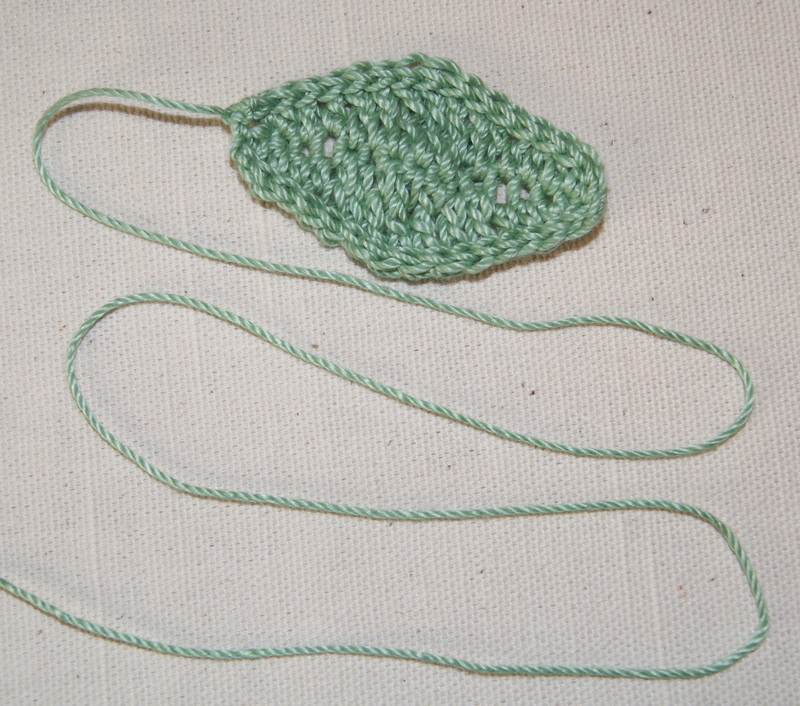 Chain 1, crochet 1 SC in same stitch. Now crochet along back edge of beginning chains and complete the same pattern exactly opposite of what you just completed: 3 HDC, 2 DC, 3 TRB, 2 DC, 3 HDC, 1 SC. Chain 1 and join with a SL into beginning SC. 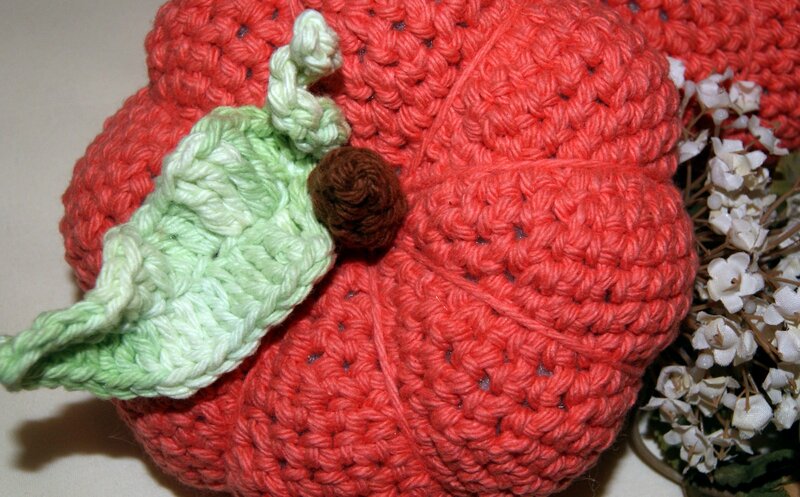 Complete a SL stitch into every stitch around the entire leaf and fasten off. Be sure to leave yourself about a 12″ tail of yarn when you go to fasten off. 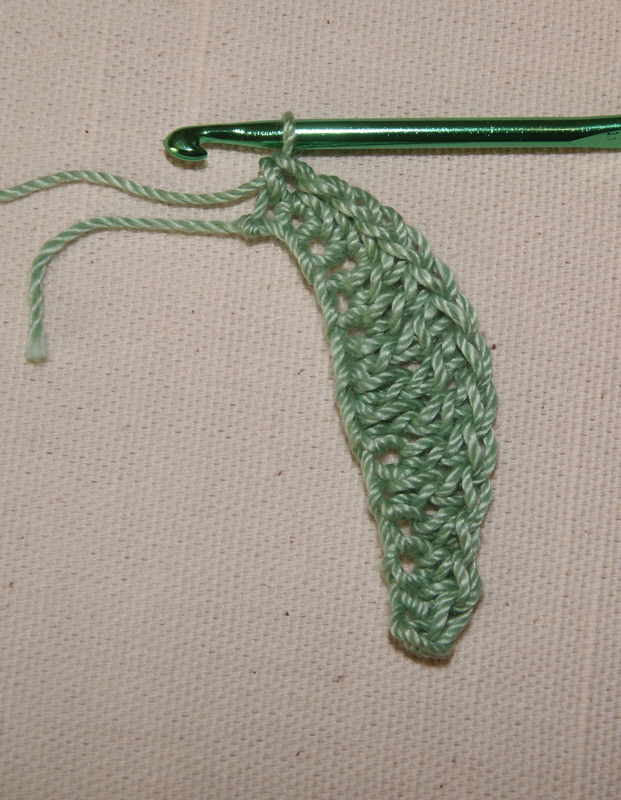 Now thread a darning needle onto your tail and begin making back stitches down the center of your leaf going from one end of leaf to the other end. The size of your back-stitch is totally up to you. 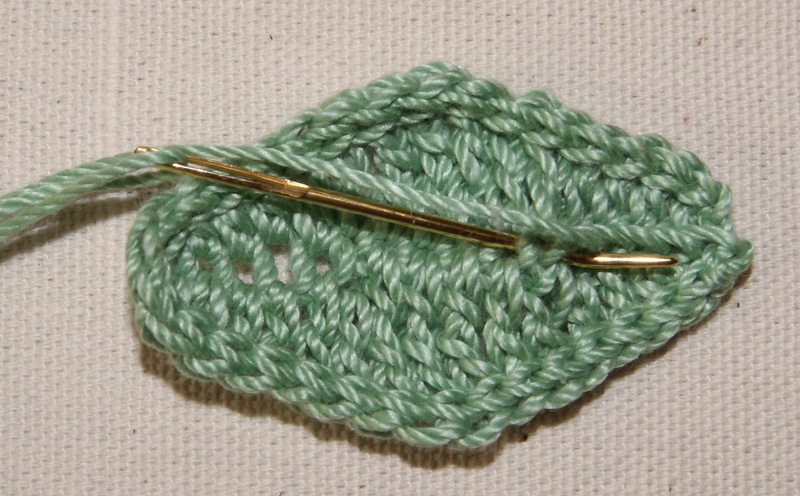 I probably make about 1/4″ long back-stitch. 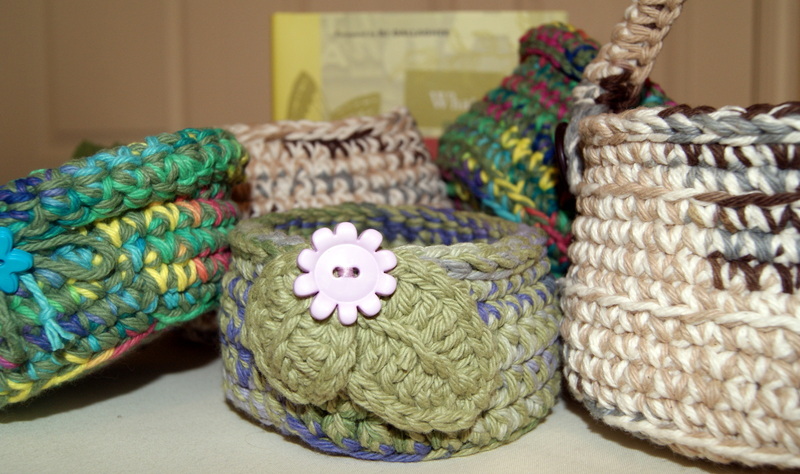 I only crochet right-handed and do everything else left-handed so my example pictures for the back-stitch are for a left-handed person. 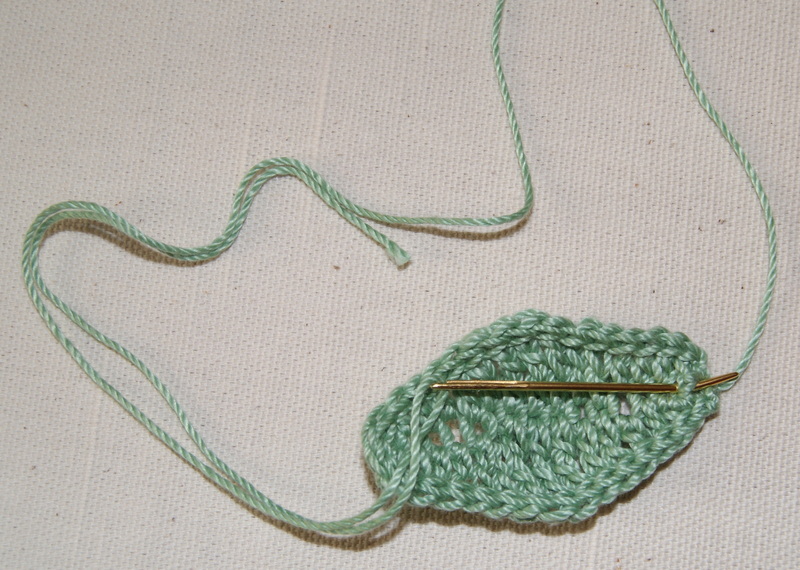 If you are right-handed, your stitches and needle will be facing the opposite direction of what I am showing. 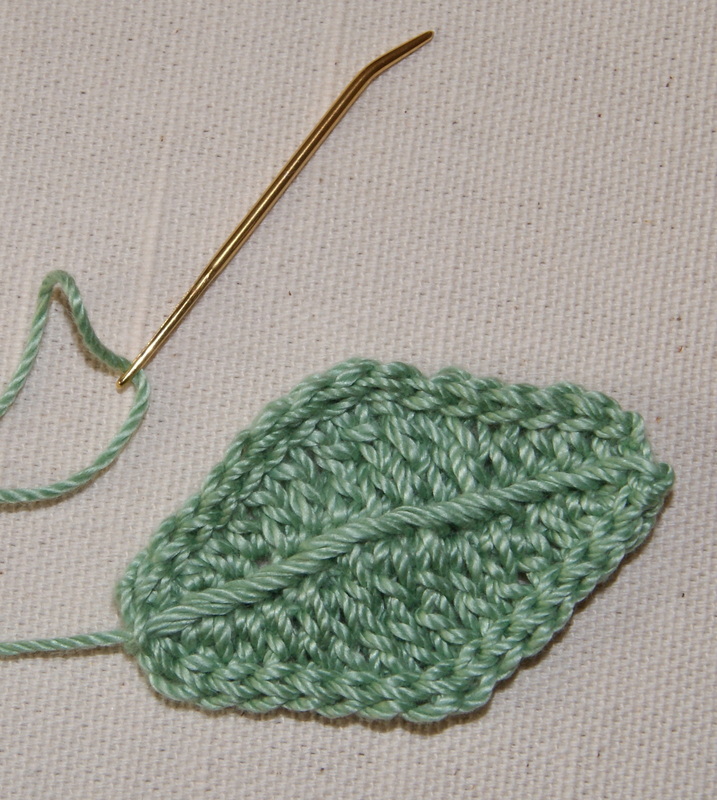 Once you have completed your back stitches, your leaf is ready to be appliqued to your project. If your tail is long enough, you can use that thread to attach your leaf. 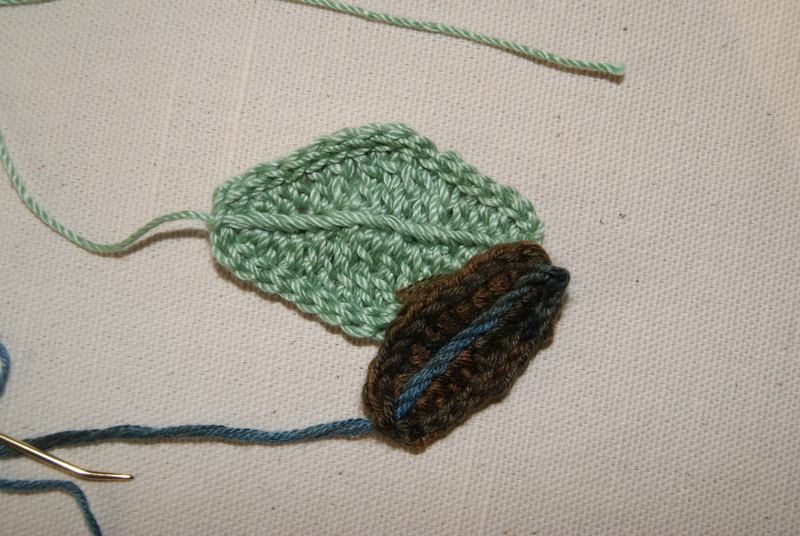 What I like about this pattern is that you have lots of variations for making smaller and/or larger leaves. 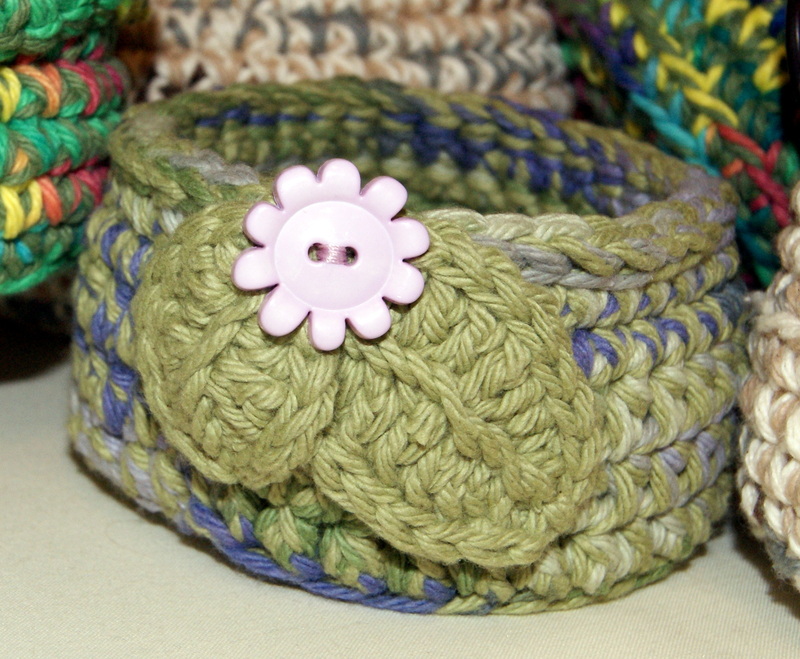 In my other example, I used a size C hook and variegated sock yarn. I only crochet 11 chains with my pattern sequence of 1 SC in 2nd chain from hook, 3 HDC, 2 DC, 3 HDC, 1 SC, chain 1, 1 SC in same stitch, then along back edge directly opposite of each other 3 HDC, 2 DC, 3 HDC, 1 SC, chain 1, SL into beginning chain and then continue around entire leaf making a SL into each stitch. Fasten off leaving about 12″ tail and make your back stitches down the center of your leaf. Just remember whatever stitches you create on your beginning chain, just repeat that pattern on the return side of the chain. 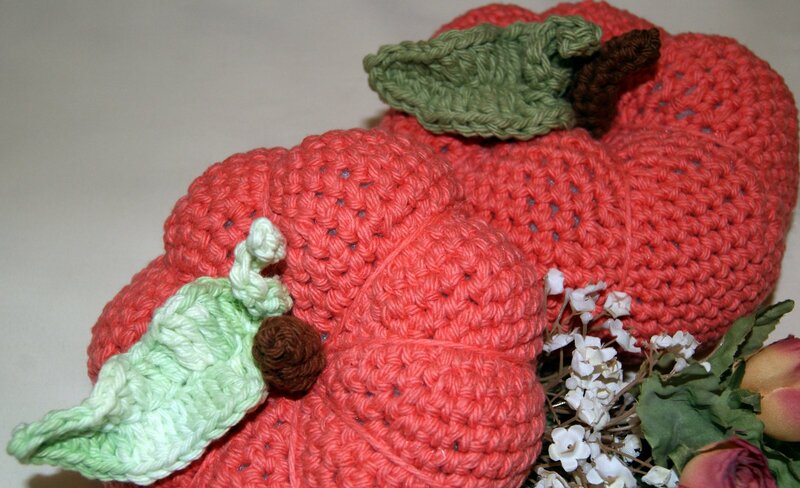 Have fun creating different leaves for your projects and remember, no raking is involved! !